Confluence IPA is the union of two of our great beers, Blue Collar Bitter and Single Malt IPA. We used the specialty malts from the Blue Collar Bitter; British crystal and black malts, torrified wheat, and flaked barley in conjunction with Floor Malted Glen Eagle Maris Otter that we use in our Single Malt IPA as the grain bill. Then we added the same amount of Simcoe and Cascade hops that we use in the Single Malt IPA. The result: a darker, richer bodied IPA that has a tried and true Single Malt hop flavor and aroma and a very smooth finish. 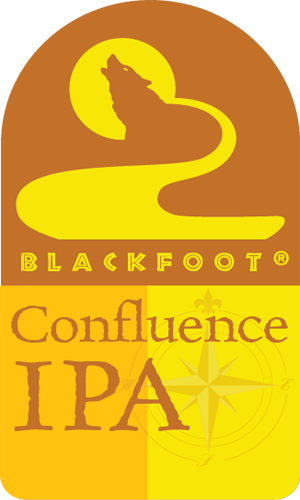 Confluence IPA was a project that started when the Blackfoot River Brewery donated a unique opportunity to the Holter for their annual fundraiser auction. The winners got to sit down with Blackfoot’s Brewers to design and name a new beer. Timothy Speyer and Aidan Myhre won the auction and helped create the Confluence IPA. Thanks for supporting the Holter and creating a great new Blackfoot beer!